Gotham Steel Crisper Tray Reviews - Is it a Scam or Legit? Using a Ti-Cerama surface, Gotham Steel Crisper Tray promises to deliver the fried taste you love, but without the butter, oil, grease, and fat of deep frying. Gotham Steel Crisper Tray is an elevated non-stick cooking rack that allows air to circulate all around your food and fries it right in the oven. And since it can help you cook without oil or butter, while all the fat and grease drip into the lower tray, the manufacturer claims Gotham Steel Crisper Tray can help you consume fewer calories. Constructed of a super slick Ti-Cerama surface, which combines non-stick ceramic with super strong titanium, Crisper Tray allows your food to slide right off, while remaining safe for use with metal utensils. You can also use Gotham Steel Crisper Tray on outdoor grills, since it’s flame-proof up to 500 degrees. When you’re finished, toss it in the dishwasher for easy cleanup. It certainly seems like Gotham Steel’s Crisper Tray might deliver a lot of useful benefits in the kitchen. But will it actually allow you to fry foods? What about “saying bye-bye to burned food”? Are there other options? Stick with us to the end and we’ll help you make a more informed Gotham Steel Crisper Tray purchase. Let’s start with price. How Much Does the Gotham Steel Crisper Tray Cost? What’s the Refund Policy? All Crisper Trays come with a 90-day money back guarantee, less S&H. This means if you also ordered the Pan, you could lose as much in shipping as you’ll eventually get back as a refund. Refunds can be requested by calling customer service at 888-822-3220. From a basic functionality perspective, there are probably thousands of nonstick, elevated mesh grates that can be placed in the oven. A simple online search for “oven crisper” or “crisping tray” will reveal just how many options you have, including popular alternatives like Copper Crisp and Crispy Mate. And if you don’t feel like shopping online, you’re almost certain to find at least one meaningfully similar option at big box retailers with kitchenware sections. 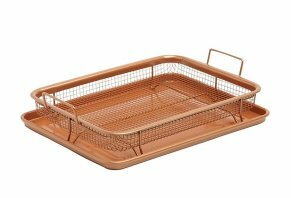 In fact, except for the name and the manufacturer, the Gotham Steel Crisper Tray appears to be identical to Copper Crisper, as well as the Rachael Ray Cucina 2-Piece Crisper Pan Set. At 10” x 13”, it’s smaller than an average cookie sheet or baking pan, so it probably won’t fit a lot of food if you’re cooking for larger parties. Pre-frozen sweet potato fries turned out much better in Copper Crisper than a traditional baking sheet. It also did a great job with frozen cheese sticks. However, the package insert said it’s not dishwasher safe, but cleaning it by hand using soap and water was quick and easy. From a price perspective, Crisper Tray and Copper Crisp are the same, although you’ll pay $1 less in S&H for the Crisper Tray. Pro tip: The point of any ASOTV product is to make it to store shelves. With this in mind, Copper Crisper was available at Bed Bath & Beyond stores at the time of our research. Granted, without having tested it ourselves, there’s no way to know if Gotham Steel Crisper Tray will perform the same as Copper Crisper. But given the fact that they’re identical, we’d think it’d be reasonable to expect as much. With so many options, how can you choose the right one? As discussed earlier, if Crisper Tray is the same size as Copper Crisp, you’re looking at something that’s about half the size of a traditional baking sheet. So, while it might be ideal for cooking a meal for one or two people, or whipping up some snacks for a handful of last-minute guests, if you think you’ll frequently cook for larger gatherings, you’ll want to purchase the largest size possible. Obviously, you could double your order, although this will also double your overall expenses. Another important consideration is what the manufacturer uses as a non-stick coating. Why? Traditional non-stick coatings often contain polytetrafluoroethylene (PTFE) or perfluorooctanoic acid (PFOA), which are generally safe to use. As they’re exposed to high heat and degrade with regular use, though, they can be released as gasses or flake off in food. When ingested, these substances can lead to health concerns such as flu-like symptoms and even increased risk of certain types of cancer. For birds, inhaling PTFE fumes can be fatal. Contrastingly, many manufacturers have started using ceramic coatings on their cookware, which provides much of the same non-stick ability as chemicals, but without many of the health concerns. As with any buying decision, price plays a role. However, you might be missing a lot of solid options by focusing solely on price. In other words, while some options might cost more than Gotham Steel Crisper Tray, the ASOTV product comes with fairly high (and non-refundable) S&H costs. In addition, ASOTV products (as a whole, not just those from Gotham Steel) tend to come with low customer ratings related to longevity. So, if some options cost more but potentially last longer, they might provide a greater level of overall value. What Do We Know About Other Gotham Steel Products? The HighYa team has reviewed several other Gotham Steel-branded products recently, including Gotham Steel Pans, Gotham Steel Double Grill, Gotham Steel Knives. Here, they tend to come with 2-star or lower average customer ratings. Why? Again, like most As Seen on TV products, customers often complained that they didn’t deliver on the manufacturer’s promises and don’t last very long. And when they attempted to contact customer support, many claimed to have encountered unhelpful representatives. Since Crisper Tray is a brand new product from Gotham Steel, we’ll just have to wait to see if it follows this same general trend. Will Gotham Steel Crisper Tray Have Your Frying In Your Oven In No Time? Although we found that the essentially identical Copper Crisper delivered on most of its claims, it won’t fry foods—at least not similar to a deep fryer. This is because the hot oil in deep frying quickly seals the exterior and traps moisture in the interior, while also creating a delicious, golden brown Maillard reaction on the outside. Even in job-specific devices like the Power AirFryer XL, Cooklite Aero Fryer, AirWave Fryer, though, they don’t move air fast enough to mimic this same chemical reaction. So, while they can help quickly heat up pre-fried frozen foods, unless you’re making french fries, they won’t provide anything close to traditional fried foods. What’s the point? Even if you have a high-powered convection oven, it still won’t move air fast enough around the Crisper Tray to fry the food it contains. Can it cook these pre-fried foods like chicken strips, french fries, and fish sticks in less fat and grease? It seems so. But since these foods are already fried and often loaded with fat and calories, the health and nutrition benefits might be negligible. Bottom line: If you’re looking to quickly heat up frozen foods without having to flip them—and without having to worry about a burned, stuck-on mess—then Gotham Steel Crisper Tray seems like it might deliver. Just keep in mind that if you’re not satisfied and decide to take advantage of the company’s 90-day refund policy, you’ll lose a decent chunk of change in S&H charges.